The Pont des Trous, a 13th century bridge in the city of Tournais, could be torn down and replaced as part of large project to create a canal that would link France with the Low Countries. The Seine–Nord Europe Canal would cost €4.2 billion to create a 105-kilometre-long canal, connecting the Seine and Scheldt rivers. It would allow for increased transportation of trade goods between between Paris, Belgium and the Netherlands. Part of the project would involve tearing down and replacing the Pont des Trous, in order to allow larger ships to pass through the canal. However, local inhabitants and heritage experts are upset by the proposal and have started a public campaign to preserve the monument. The Pont des Trous is flanked by two towers: one known as The Bourdiel (1281) on left bank and the other, known as The Thieulerie, on the right bank (1302-1304). The curtain wall is perforated with bays and arrow-slits. The connecting bridge was destroyed during the Second World War and rebuilt in 1947. During this reconstruction the towers and pillars were elevated by 2.4 metres in order to facilitate the passage of the ships. In November local authorities outlined a plan to have this bridge replaced with a new version. Local heritage groups have complained that they were not consulted about the plan. Lenfant adds, “as many historical monuments, the Pont des Trous has evolved over the centuries without losing the elements that define it as a fortified gate. 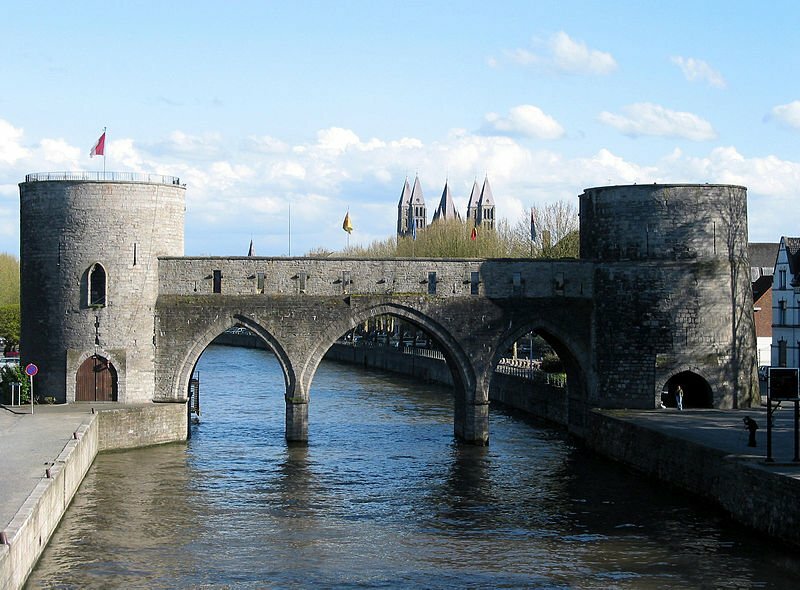 With the towers of Saint-Jean and Marvis , the ‘Pont des Trous’ is one of the few witnesses still visible from the second wall (thirteenth century) but also one of the last water gates in Europe. Due to its heritage and historical interest, the Bridge has been classified by the Walloon Region in 1991. The classification decision concerned not only the building, but also the docks and the Garden of the Queen (Le Jardin de la Reine).